MANHATTAN (CN) – A union representing 38,000 subway and city bus workers sued the Metropolitan Transportation Authority, saying the agency unfairly blocked an advertising campaign about the battle for higher wages. “We want the public to have a better understanding of what it’s like to be a transit workers,” union president John Samuelsen said in a statement, noting that transit workers “pay a heavy price in blood” to move more than 8 million riders each day. Samuelsen’s group, the Transport Workers Union of Greater New York, Local 100, has three contracts with various MTA agencies set to expire on Jan. 15. Anticipating a grueling labor dispute, the union tried last month to buy $190,000 worth of ad space from the MTA. In a Dec. 4 complaint e-filed with the U.S. District Court for the Southern District of New York, the union says MTA tried to justify rejecting the ad by misclassifying its message as political. Insisting that there is no political issue involved, the union included a copy of its ad as an exhibit with the complaint. Titled “We Deserve a Wage Increase for Our Sacrifices,” the ad depicts four MTA employees who faced on-duty assaults, including one in a neck brace and another with a brutally slashed arm. 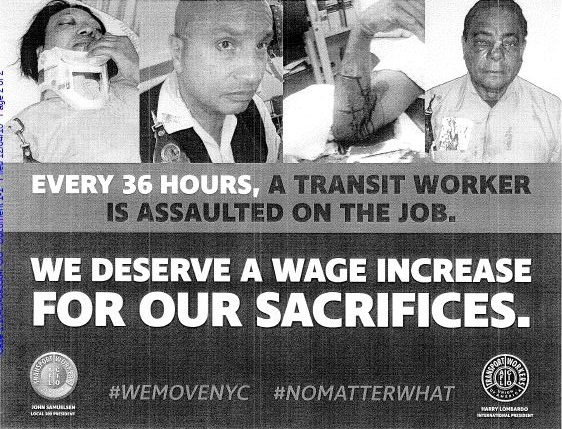 “Every 36 hours, a transit worker is assaulted on the job,” the ad says. MTA spokesman Kevin Ortiz declined to comment on the lawsuit but said that the advertisement was forbidden under the new policy because it was not a commercial, governmental, or public service advertisement. Ortiz also said that it was political in nature because it advocates an “opinion, position, or viewpoint” about a disputed issue or cause. Though the MTA has pointed to a policy on political ads that came took effect in April 2015, the union notes that this position is undermined by recent unrest over the emergence of Donald Trump as president-elect. In the last month, “the MTA has allowed citizens to post thousands of ‘Post-It’ size and larger size political messages in the subway passageways, mostly critical of the President-elect,” the complaint states. “Those notes, which are posted and reposted daily, have, for three weeks, undercut any contention that the subway system is not a public form,” the complaint also states. It had been the MTA’s policy for years to accept paid advertisements from both businesses and nonprofits for display in subway stations and on buses. Any ad was welcome under that policy, as long as it was not misleading, did not promote illegal activity, wasn’t obscene, and would not be expected to incite violence. Ruling against the American Freedom Defense Initiative in March, the Second Circuit said the MTA could reject such advertising as long as similar political ads also were rejected. The court allowed the group to challenge the MTA’s advertising policy, but it has not yet done so. The union’s lawsuit comes as it approaches the Jan. 15 expiration of its collective bargaining agreements with the MTA Bus Authority, NYC Transit Authority and the Manhattan and Bronx Surface Transit Operating Authority. Noting that one past labor dispute resulted in a three-day strike in 2005, the union says it merely wants to keep the public apprised of its bargaining efforts. It had planned to run its advertisement in roughly 120 subway stations for nearly two months. The union seeks wage increases above inflation and to abolish one of the city’s pension-contribution systems started under Mayor Michael Bloomberg, among other concessions. Last year the union posted advertisements claiming that the city subway system could degenerate into decrepitude similar to that of the 1970s over funding for the MTA’s $26 billion capital plan. That advertisement showed Mayor Bill de Blasio jumping a subway turnstile. De Blasio derided the ad at the time. Sunday’s complaint seeks an injunction and a ruling that the MTA’s policy violates the First Amendment. The union is represented by Arthur Schwartz of Advocates for Justice, Chartered Attorneys.